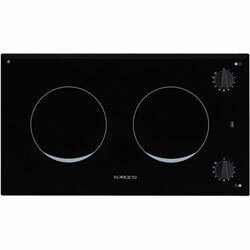 Force 10 Ceramic Glass radiant cooktops add a touch of class to any galley. With powerful 1200 Watt burners and a smooth easy to clean surface, cooking and cleanup is a breeze. Safety features include over heat shut off and residual hot surface indicator. All units are UL Listed and CE approved and are available in 1, 2, and 3 burner models in both 120 and 240 Volts.